A new Android tablet contender will enter the ring, with Matsunichi's MarquisPad MP977 arriving later this month. 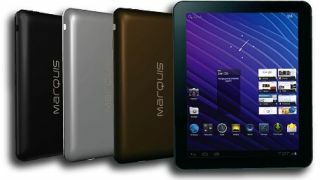 The MarquisPad boasts a 9.7-inch display at 1024x768 resolution and Android's Ice Cream Sandwish OS. And with that combination, the tablet sounds like a steal with a retail price set for $249. What's more, even though the rest of the MarquisPad's specs aren't exactly set to impress, the device has some redeeming qualities. It's equipped with a 1.2GHz dual-core processor and 1GB of RAM, which won't break any speed records but should make it slightly zippier than the Samsung Galaxy Tab 2 series. A front-facing VGA camera will be its sole source of picture taking, with no rear-facing camera on the device. It will also support Wi-Fi 802.11 b/g Wi-Fi and Bluetooth 2.1 + EDR, with a 4000mAh battery said to last five hours. Another drawback includes the mere 2GB of internal memory, but MarquisPad owners will have the ability to expand that memory by up to 32GB through a microSD card slot. A 2GB microSD card will be included with the device, bringing the total out-of-the-box memory up to 4GB. The MarquisPad MP977 launches in the U.S. this month, with its price and size making it and intriguing option even with some middling tech behind it. Matsunichi isn't done though, with a more robust MP1010 expected sometime between June and August. The 10.1-inch tablet will upgrade to a 1.5GHz dual-core processor, backed up by 10GB of internal memory, the addition of wireless-N support, and a beefier battery. A new 9.7-inch tablet, dubbed the MP979, is then expected with similar specs sometime in the August to September range. There are no price details yet on the MP1010 or MP979 tablets, but here's hoping that Matsunichi will continue with similarly aggressive pricing to the MP977 as it tries to break into the increasingly flooded Android tablet market.